A press preview of the movie "71-Into the Fire" was held at Lotte Cinema in KunKook University branch on June 3. 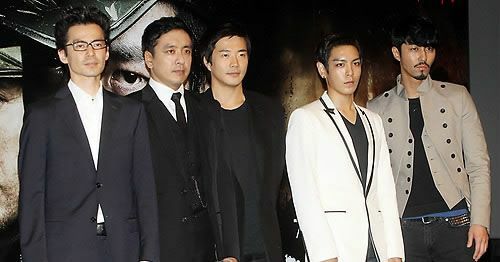 Director John H. Lee and cast members (from left) Kim Seung-woo, kwon Sang-woo, Choi Seung-hyun, and Cha Seung-won pose for pictures.Director John H. Lee: "I have given special attention to making visuals. I seriously considered every scene to make beautiful scenes". After the press preview held on Lotte Cinema Kunkook University branch on June 3, director John H. Lee had participated in the press conference and said, "I devoted myself to film every scene of this movie. This movie is my ambitious work". The movie "71-Into the Fire" is a blockbuster movie with an investment amounting to 11.3 billion won for production. Vivid and vigorous battle scenes and splendid images in the film are outstanding. Lee mentioned, "I was seriously concerned about making images. The scene that I made my utmost effort to make perfect is the last scene on a rooftop where four main actors come together". He also explained, "The scene where the cast members fall down one by one symbolizes the tragedy of fratricidal war". The movie "71-Into the Fire" was produced based on the real story of 71 student soldiers who took part in a pivotal bloody battle in the Nakdong River region in August, 1950, which was the most important battle between North and South Korea to decide the victory of the war. The army led by Kang Seok Dae (Kim Seung-woo) had been withdrawn from Pohang to defend the Nakdong River area and left only 71 student soldiers behind. Jang Bum (T.O.P - Choi Seung-hyun) was appointed as a company commander, but his troops periodically caused friction with other soldiers led by Kap Cho. 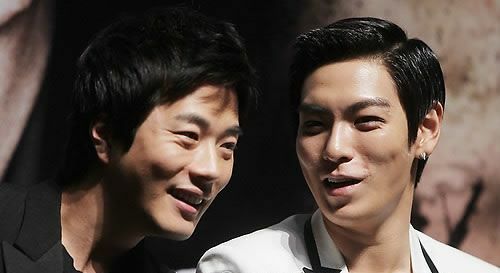 Actor kwon Sang-woo and T.O.P (Choi Seung-hyun), who participated in the press preview held at Lotte Cinema on June 3, give their thoughts on the film.Park Moo Rang (Cha Seung-won), a commander of North Korean soldiers who devastated the Youngduk region with his 766 guerrilla troops, disobeyed the Communist Party's order to advance to the Nakdong River, instead secretly changing course into Pohang and ending up fighting with the student soldiers who were left behind. The movie was caught up in controversy from the beginning. It had been released for the first time in a preview held at the Asia-Pacific Research Center at Stanford University. At that time, an old map shown in the beginning of the movie indicated the East Sea as the "Sea of Japan", so it evoked much criticism. Director John H. Lee urgently apologized by saying, "We were busy preparing for the final film, so I could not pay enough attention to the preview held at Stanford University. Everything is my fault. I am so sorry that we have caused a shameful thing and I really regret that". T.O.P(Choi Seung-hyun) debuted as a movie actor through this movie and he said, "I tried to be natural rather than act because I did not want to be seen as obviously acting. To be the 17 year-old Jang Bum, I did not care about my appearance and I just put all my energy into it".